Sometimes thinking things through a bit might lead to better results–but then the ‘what ifs’ take over and how will you know unless you try it? 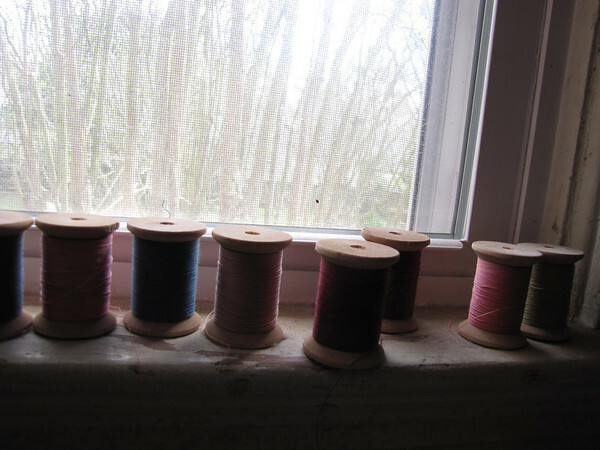 I had a small collection of glazed cotton threads for hand and machine quilting all on wooden spools. Somehow some of them had mildew forming on them and although I had tried putting them in a bag with a paper towel soaked in chlorox–thinking the fumes would kill off the mildew–they still had some mildew present. And so I stuck them in a laundry bag and into the washing machine with towels etc. and ran them through the entire cycle. I pulled them out before stuffing my towels into the drier and put them above the heater in our bedroom. I did have rather a mess of tangled thread in the towels–and all the labels came off the spools so I can only go by color, not by name. I’m not sure I’d recommend this method of clearing up mildew.